Anxiety is a normal reaction when a person is confronted with stress. It happens if we particularly experience events and circumstances that cause us to be anxious or nervous. But, if you experience anxiety accompanied with other indications such as having nightmares, sleeplessness, obsessive compulsion, among others, then you will be suffering from an anxiety disorder. Causes of anxiety disorder often range from environmental, psychological, historical and even genetic. When a person is confronted with anxiety disorder, it often becomes problematic in how to manage it with our daily lives. OCD is an anxiety disorder that causes people to have obsessive thoughts. People with OCD often display obsessive and compulsive actions and mannerisms as a way to reduce their anxiety. Symptoms of the disorder includes compulsive checking, too much washing and cleaning, an obsession for particular numbers and neurotic practices such as continuous opening and closing of doors for a number of times before coming in or out of a room. People with OCD are often confronted with emotional and financial distress; this is because the symptoms of the disorder can often lead them to alienate themselves from the outside world. This type of anxiety disorder often develops in people who have experienced a traumatic or terrifying event. It often occurs in persons that have experienced the unexpected death of a relative or loved one, sexual or physical assault, among others. In fact, PTSS was first brought to the public due to the experiences of war veterans. But eventually, PTSS can happen due to a variety of other traumatic experiences. A phobia is an intense fear for a specific objects or situations. Phobias can range from a fear of certain animals such as snakes and dogs or being anxious in experiencing some situations such as being on top of a tall building or flying. While the level of fear is specific, phobias can be very threatening to the way of life of its sufferer as even the most normal of situations can be anxious for him or her. Also called social phobia, social anxiety disorder happens when people become extremely anxious and self-conscious in daily situations. In fact, one symptom of social anxiety disorder is having an intense and chronic fear of being watched and criticized by others. If faced with a dreaded situation, people with social anxiety disorders could become anxious and nervous for days or weeks. Also, people with social anxiety disorders have a hard time making and keeping friends. People suffering from GAD often become anxious and worry over nothing at all. GAD sufferers are oftentimes extremely worrisome. They also have an exaggerated level of anxiety. They may also have an unrealistic view of some problems that they encounter. People with panic disorders often have a feeling of extreme fear or terror that suddenly strikes them without warning. Panic disorder differs from normal fear and anxiety as it completely affects how sufferers deal with their daily lives. Panic disorders often occur along with other serious mental ailments such as drug abuse and alcoholism. Generally, people who suffer from different types of anxiety disorder experience symptoms ranging from the physical (nausea, muscle tension, dry mouth, shortness of breath, etc.) to the psychological (sleeplessness, uncontrollable obsessions, having repetitive nightmares, ritualistic behaviours etc.) For those who currently suffer from anxiety disorders, you don’t have to worry about suffering from it for the rest of your life. 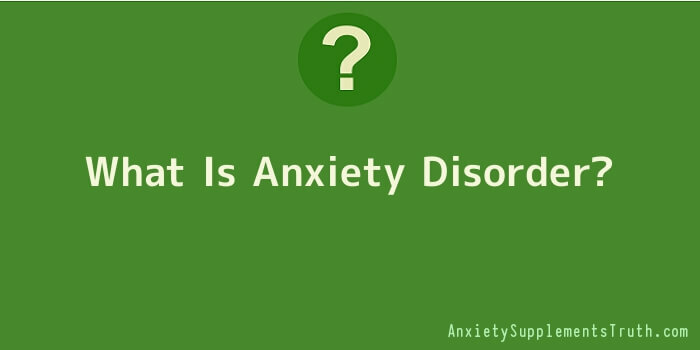 An anxiety disorder is treatable; but it can only be treated if the sufferer is willing to undergo the necessary treatment procedures and medications. Treatment can either last for a minimum of weeks to a few years. Treatment and medication can also differ from each case as some anxiety patients may often suffer from more than one psychiatric disorder or if they suffer other ailments that had increased their anxiety disorder’s progression such as alcohol and substance abuse. For those suffering from it, professional help such as hiring a therapist is a good option. And as for relatives and friends of the sufferer, it always a good option to help and support them with their problem. It does not help the sufferer to abandon them to their fate, but rather to cope in his or her time of need.